Russia and the United States have not always had the warmest of relations. In fact, they were downright COLD in the years after World War II. 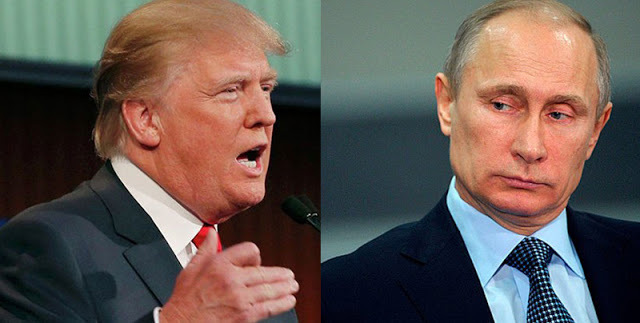 But now, after years of disagreements, sanctions and vague threats to start World War III, things have changed for these two powerful nations. A heartwarming love story has sprouted between the Russian president and the loudmouthed bigot who wants to be president of the USA. The two of them are now such buddies that Donald even defended Vlad from the accusation that he has ordered the death of journalists. Donald honestly can’t imagine why anyone would kill a journalist, as he would rather kill himself than be away from media attention for one moment. 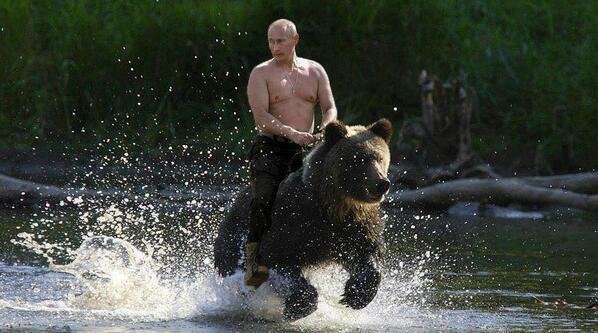 When he has time, Donald plans to join Vlad in bombing Syria and also go riding bears while shirtless. It’s a good form of daily exercise for manly men like Vlad and Donald. Unfortunately, the love story between Donald and Vlad is also a tragic one, undoubtedly doomed not to last. After becoming President, Donald has a lot of stuff on his plate. He does not have the time to hang out with Vlad and persecute minorities together. First, Donald has to build that wall between the U.S. and Mexico. Then he has to get rid of all the Muslims trying to get into America, but it turns out to be unexpectedly difficult to tell what someone’s religion is from their appearance, so to play it safe, Donald wages war on everyone with brown skin. Donald is so busy being an incompetent leader he fails to notice Vlad’s warmongering in various parts of the world. Meanwhile in Russia, the state-controlled media continues pointing to the United States as the shining example of everything that is wrong with the world. Donald is so furious that for the first time in his life he is speechless. He rushes to the oval office and issues an order to launch a nuclear strike against Russia. His advisers only manage to convince him out of it by pointing out that starting a nuclear war would affect the profits of his hotel chain. Donald is crestfallen, realising for the first time that his actions have consequences. For a moment, he vaguely considers the idea of opening his heart to Vlad and forgiving him for their differences. But then he remembers that this would make him look weak and not at all like a tough guy like Vlad. For some reason, Donald really wants to feel validated by Vlad. So Donald decides to win everyone’s approval in the only way that he can think of. Posted on December 22, 2015, in Pairings and Shipping and tagged 12 days of not anime, 12 days of shipping, Politics, trump x putin. Bookmark the permalink. 19 Comments. Cut me some slack, man! Twelve posts is hard. I’m writing on the edge of my seat here. Of course I am, I love them both. … Okay, nope, can’t say that with a straight face. Have you ever seen koalas fight? Vicious, vicious creatures, who then make sad honking noises at each other. Or death metal grunts. Tony Abbotts the tsundere third wheel in this relationship. You are a bad, bad, man, and evidently entirely evil. What can I say? It isn’t that impressing to make any comment about. Hey, maybe you can write some praises on Bernie Sanders! The Internet loves him! Just expect him to win the Presidential Race in… 2032. It’s strange. I don’t say that we should, or could completely keep platforms like this from politic, but then again, we aren’t really that concern about it in a constructive way. There is no relationship. Putin is just playing him~ and Trump is taking it like a little girl being hit on by a handsome man for the first time.